Vanguard Logistics is now present in Nairobi and Mombasa, Kenya partnering with Africa Freight System (AFSL). Vanguard presently operates 5 weekly direct services into Kenya from Antwerp, Durban, Jebel Ali, Nhava Sheva, and Singapore. Full scheduling details can be found on our website at vanguardlogistics.com/sailing. 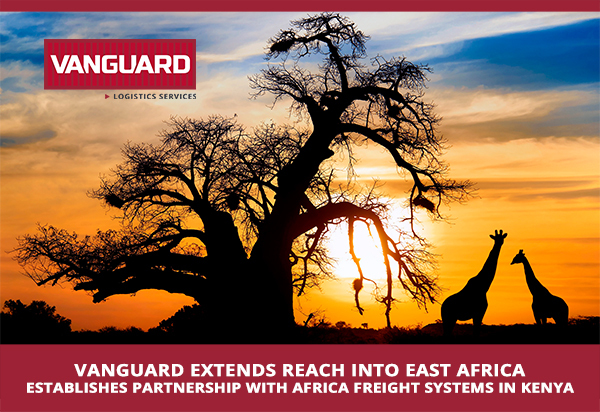 Vanguard’s presence in Kenya further extends its ability to serve the East African freight forwarding community through its integrated and seamless neutral transportation solutions, extending its reach through land transport consolidations to neighboring countries, Uganda, Tanzania, Zambia, South Sudan, Ethiopia, Burundi and Rwanda.